Sweet Potato Biscuits Recipe includes a "to die for" Honey Cinnamon Butter. Or spread with our special Cinnamon Honey Butter recipe below. 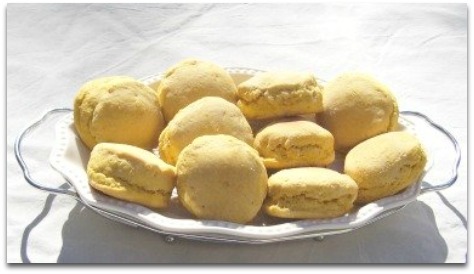 The original Sweet Potato Biscuits Recipe came from a very old. favorite cookbook. I wanted a breakfast biscuit instead of the original, which seemed to me more like cake than bread. So I changed many of the ingredients; substituted brown sugar for molasses and reduced the amount, omitted the eggs, switched to buttermilk instead of sweet milk. I changed the fat ingredient for a more distinct taste. Wash and scrub dirt from sweet potatoes. Place lid on and bring to a boil. Remove potatoes from water and place in a colander to drain and cool. When cooled enough to handle remove outer peelings and mash while still slightly warm. Place 2 1/2 cups of the sifted flour into a medium size mixing bowl or whatever container you use to make up your biscuit dough. With your fingers create a little well in the center of the flour. Drop in brown sugar, butter and bacon drippings. Mix together with a fork or your fingers while keeping in your little flour well. Then add the slightly warm (thoroughly drained) potatoes and mix all that into your well. Then start mixing and pulling in a little flour at a time into the center until your entire 2 1/2 cups of flour are incorporated. You will now have a dough ball. It is probably a little sticky. Sprinkle some of the 1/2 cup flour onto a pastry cloth (I use a clean kitchen linen cloth) or whatever you roll dough on. Scrape out your dough onto your pastry cloth. Keep adding flour to it as needed to prevent it from sticking to your cloth. You may need to flour your dough and cloth, turning the dough over a few times while you knead. You want your biscuits to contain as little flour as possible to keep their great sweet potato taste to, but have enough flour to enable you to handle them while cutting and placing on your biscuit pan. When all flour has been used up and dough is ready for cutting, pat down dough or roll to about 3/4 inch thickness. Cut with a 2 1/2 inch biscuit cutter. Place on a lightly buttered biscuit pan and bake in a preheated oven 400F. 12-15 minutes until done. Remove from baking pan when done and brush tops and bottoms with melted butter. This keeps them soft. Serve hot immediately or cool and store in a tight fitting container to retain their freshness. *When checking your potatoes for tenderness, it is better to use tongs or a spoon to press them on the outside. Poking them with a fork can make holes that fill up with water and may or may not drain out. If they are too soupy when adding to your flour mixture it creates a need for additional flour when kneading. Melt butter 35-40 seconds in the microwave. Stir in Cinnamon until smooth. If your honey is especially thick you may need to heat it slightly, along with the butter to get a smooth mixture. This butter is equally fabulous warm or cold with this Sweet Potato Biscuits Recipe. You may also serve it as mentioned above or on toast, pancakes or waffles. I haven't tried it yet, but I think it would make an excellent dip for sliced tart apples.